Seminyak, Bali is filled with killer restaurants, from extremely affordable local food, to high end gastronomic Michelin starred restaurants. 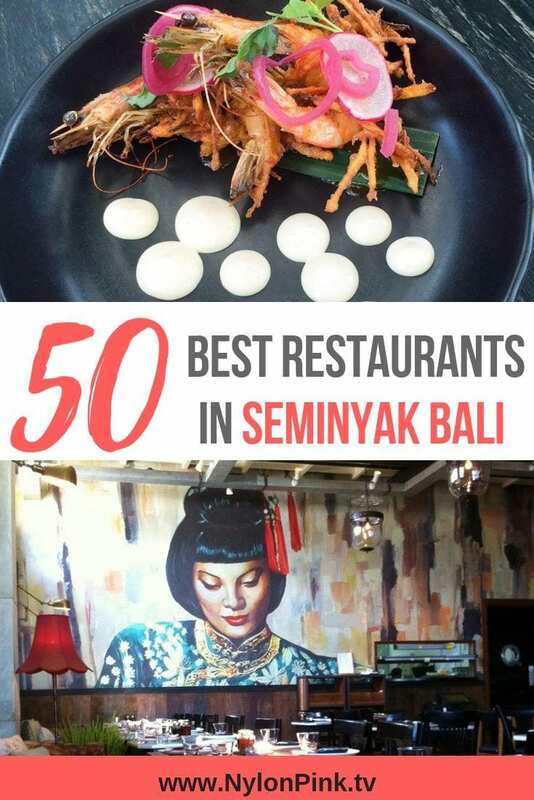 We've collaborated with many top travel writers and bloggers to put together this list of the top 50 restaurants in Seminyak! Potato Head is one of the most iconic restaurants in Seminyak, Bali and for good reason! The ambience is cool, fun, and relaxed, and the service is top notch! The design of it is very unique, as it was crafted from antique shutters that were salvaged throughout Indonesia. The designer will also create pieces to show how terrible pollution is to the environment, and his newest piece, “5000 Lost Soles” features 5000 flip flops found along the beaches of Indonesia on a bamboo frame. I'm a big fan of how eco-friendly Potato Head is, especially the plastic free part! We chose to eat here because the food is always amazing, locally and organically sourced, and the sunsets here are unlike any in the world! I ordered the trout and it was cooked to perfection, and my boyfriend got the fish and chips. The portions were VERY generous! The cocktails here were also very unique and beautifully crafted (a little pricey for Bali standards) but worth every penny! I would have tried every cocktail on the list! I will never forget the unreal sunset we witnessed after walking down to the beach afterwards, it was like the sky was on fire. The resident DJ was spinning laidback tunes perfect for the atmosphere, and vibes made for an unforgettable night! Here is a spot with a gorgeous atmosphere where diners feel more like kings and queens than vacationers. A fine selection of liquor is also available, with knowledgeable bartenders. They serve all your favorite cocktails, too. This place caters exclusively to seafood lovers, and the menu is extensive. Try the seafood pepes, the juicy shrimp, squid and snapper complement one another. For an entrée, try the black pepper bamboo lobster. It’s a worth-it splurge! The restaurant specializes in shrimp, per its namesake, but also offers favorites like snapper, crab, octopus, and of course, lobster. It’s a new face in the world of Balinese restaurants, but that’s nothing to be afraid of. They only opened in 2012 but have made a huge name for themselves for the quality, great taste, and thoughtfully prepared dishes. Be sure to stop during happy hour for good deals. If you are looking for some late eats, try kendi kuningh. They are open until 11 pm and serve up some delicious grub. The atmosphere is quiet, and the staff keeps the place very clean. Meal preparation is done with pride. The seafood is cooked over coals, giving the cuisine a very authentic char-grilled taste. We recommend the lobster, as you can get it in two ways-grilled or baked inside an oven. The spring rolls are giant and filling. If you are traveling with a person who does not care for seafood, have them try the curry chicken stew or curried rice. Mee goreng and grilled prawns are also available, and the price of the beers cannot be beat. The brews will pair nicely with your meal while quenching your thirst. Prices are extremely fair for what you get, and you will only want more upon leaving. Get ready for great seafood served in a welcoming and warm atmosphere. Beers are cheap and delicious. Reasonable prices for the best seafood you've had in a while. We recommend the chicken wings, fettuccine seafood, and the Balinese seafood platter. Servers are well informed and will be able to answer any and all questions you have about the food to be consumed. It’s all made fresh, so there may be a wait. The restaurant is rather small, but in a good location and is a nice place to bring a group of friends or your family. There is a meal for everybody. You will feel like a celebrity when you eat here. The views are top notch and you look over the sea as you eat. It is expensive, but the quality speaks for itself. Sometimes there is live piano music. You will enjoy the view-you can see the pool and/or the beach depending on where you are seated. The sounds of other diners chatting coupled with the lovely piano music only enhances the flavor of the great food. Get the gazpacho to start, and then try the red snapper for dinner. You can have different sambals to go with it. Here is a restaurant with a casual, breezy setting, perfect for dining outside with your favorite friends. This website has made its way onto several travel review sites as being an amazing place to eat. If you are from a western culture and feeling a bit homesick, try this spot. It’s got a fusion of the west and the east you will enjoy. Brunch is available here, and reservations are recommended. You can do that on their website. Chef Ashley Garvey is a Melbourne, Australia native who seamlessly blends two cultures for a taste that will leave you wanting more. We recommend deluxe seafood platter for two. You get an amazing variety of seafood to savor with a loved one, including lobster, king prawn, two sashimi, and some clams. That’s not all, of course. You get much more. If you are a spicy person, try the taste of Indonesia hot seafood platter. The first thing we would like to mention to you is that this restaurant offers a rice paddy view, which is one of the last in Seminyak. All the vegetables and fruits here are sourced from the Bali highlands, offering the native taste to you. Take a respite on the cozy sofas made of bamboo. This cuisine is fresh from the sea, and we recommend choosing the Chef's sardine special. Look for the entree with the red ginger rice, Chinese baby cabbage, and ponzu sauce. Choose a local cocktail for maximum effect and a unique accompaniment to your meal. For dessert, indulge in Flores Pineapple Carpaccio or the dessert sampler. This is an elegant beachside eatery that is perfect for celebrating a special event or just making a memorable dinner memory. The outdoor hanging lights in the open-air patio mean that you get to enjoy the fresh air and beach breeze. The live music is a nice touch, especially if you are on a date. If you require a private dining experience, you can reserve a table inside. The menu provides much to choose from without being so overwhelming that you cannot decide. You can even get together with friends from 11 am to 4pm each day for buy one get one cocktails, which can make a nice start to a holiday. For dinner, the seafood marinara cannot be beat, and neither can the jumbo prawn. You can also get Indonesian specialties, or just a good old cheeseburger if you want a classic, good taste. Perhaps the choice for foodies everywhere, this gastropub is here to take you on a journey. You can choose from one of four menus that will offer you a full course dinner. Asia and France come together to create wonderful dishes crafted by the chef that he changes every six months. You will get a unique taste every time. Everything from the start of the dinner to the end is prepared with the utmost of care. The staff will guide you along the journey, explaining to you the importance of each course as it is introduced to you. You will gain a new appreciation for the food’s placement and preparation. Chef warokka is an award-winning chef, and he will make sure you and your fellow diners leave with satisfaction and even better knowledge of food and how to appreciate it. Also make sure you opt for one of their wines. The laneway offers you a chic, modern place to sit down and enjoy yourself. You can stop by for dinner, lunch or even just go to their bar for a cocktail or beer. We liked best the farm portion of the menu, which featured fresh ingredients that used traditional Indonesian ingredients. A strong choice is the kambing guling- the lamb is tender and just the right size. The Balinese fried spiced duck is complemented by the orange sauce which is nice and sweet, and the shallots that go into the dish are fragrant and delightful. There are healthy and vegetarian options, too. This location is within a hotel, so do be sure to make a reservation ahead of time. This way you can make sure you get a table at this exclusive spot. After dinner, play some pool at the nearby table or relax and chat on the nearby lounge chairs. The name breeze is not just a name that was chosen from a hat. This is actually for the wonderful breezes you will enjoy as you sip your tea, eat your entrees, and savor your dessert with your loved one. A relaxing ambiance means you get to reconnect and rekindle over a beautiful view. Menus are dependent upon the local harvests, so be ready for a fresh, great taste. Meals offered are breakfast, lunch and dinner, so you can come any time for happiness. From the regular dinner menu, we recommend starting with pan seared foie gras, as the red cabbage compote provides a nice touch. The seafood nasi goreng can be served with fried rice or noodles and is delicious. You can also choose favorite seafood dishes like paella, or Australian inspired dishes. Once you have savored these tastes, have a cup of tea and some sorbet to cool down. This is a restaurant with a lovely, romantic setting, and farm-to-table foods. The wine offerings here cannot be beat, and you will enjoy choosing one to pair with your meal. You can get a bottle and share for an even more romantic experience. You will enjoy some soup and bread while you wait for your meal, but when it does arrive, the freshness will blow you away. Live music can be enjoyed every Tuesday through Saturday, and opera is performed on Thursdays. For starters, we recommend the fritturina, which is baby squid and prawns fried to a golden crisp. For dinner, the tagliatelle al reagu di anatra is a rare gem among a region known for seafood spreads-it is pasta with a duck ragu, which is then slow cooked in tomato sauce. For dessert, you must try the tiramisu. The coffee-soaked cakes and cacao will provide a delicate but strong blend of flavors. If you are in love with the roaring 20’s or want to live like you are in the great Gatsby, we recommend the plantation grill. The atmosphere looks like you are stepping into a movie set where flappers and gangsters might congregate. You get to feel like a star while you eat. Be advised that there is a dress code, and reservations are recommended. The food will make it worth your while. You can enjoy cocktails late into the night, as the place closes at midnight. There is live jazz available on some nights. We recommend that you choose a steak, as your chef will cook it exactly to your liking in a way unmatched by other establishments. The food, the service, the atmosphere and the cleanliness are all above average. Make sure to really sit back while there, look around, and take it all in. Here is a great place to have the taste of a backyard barbecue. 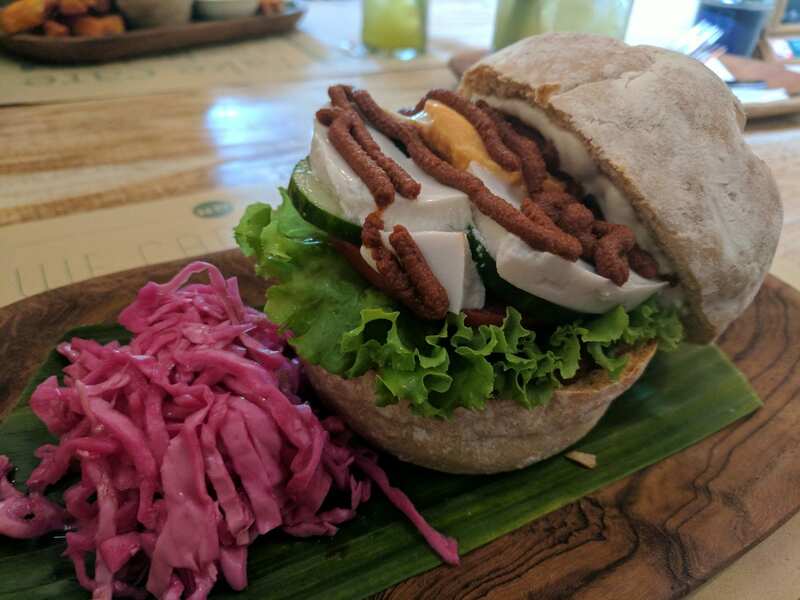 Hamburgers are enjoyed around the world, but they taste great in Bali. The menu features all kinds of funny named goods, like the unicorn shake (that’s coming soon), wacko crispy wings (chicken wings with spicy mayo), and the down under burger. The service is friendly, so the staff will certainly treat you right. Bring a group of friends and have each order one of their unique burgers. That way you all can cut off a piece and take a bite! Our favorite was the speedy Gonzales burger, which featured sour cream, corn chips, pickled jalapenos, and tomato chutney, plus some great crispy fries (chips for our UK friends). You can even eat healthy here if you need-salads are available in three varieties, and so is the side dish of buttered corn on the cob. Variety is the name of the game when it comes to Chandi. You will likely not know what to choose, so consider bringing your appetite and some friends. You can all order and share the many wonderful dishes that they offer during their lunch time. There are plenty of options for everybody. Some of our favorites were the amazing crunchy tofu squares, as they whet the appetite and make you hungry with anticipation. The peanut sambal was a nice touch. The flat breads with peanut dip were amazing, and the temepe avocado arugula wrap was a great way to eat healthily and not miss out on taste. Chicken nasi goreng and seared sesame tuna noodles were also favorites. You will get a lovely, laid back atmosphere, perfect for gathering and having a chat with friends. The food is wonderfully presented, and carefully prepared. Be sure to eat slow and savor the bites! Here is a great place to go if you are from the UK and need a little taste of home. This is a nice little fish and chip shop. You can also take advantage of the English breakfast menu. Some Indian dishes are available too. It’s a smaller place, but it is open until 11 pm, so even late eaters will have something to choose from. Coming for breakfast means you can choose your own dish and mix it up the way you want. We enjoyed this, but felt the beans were a little watered down. It’s a nice place to sit inside and relax, the tube logos lend a nice UK feel to the dining area. This is a nice place to come if you have travelers that prefer a similar taste to home, or young children who still do not want to try new foods. Tamade cafeteria’s menu is a lot like the paper menus you may see back at home, which is a welcome sight to nervous or new travelers. The fare is just what you would expect and tastes good for a cheap price. The décor is quirky and cute, with lucky cats adorning the place. For about 5 to 8 dollars a dish, you will get filled up by the lovely couple who runs the café. You can enjoy some competitively priced drinks, too. We loved the sweet and sour pork, which tasted wonderful. The bbf, or beer-battered fish, is also nice dish, breaded and fried perfectly to a golden crisp. You will enjoy the quiet atmosphere, great prices, and taste. Others who have visited indicate that the only thing they didn’t like was that they were just left wanting more. Another noted that everywhere else just comes second after eating at tamade. If variety is what you seek, warung ocha has you covered. Their sign boasts free Wi-Fi, which is always good for those who want relaxation and some play time with their phones while waiting for friends or family to arrive. Breakfast is served all day, and there is a buffet option too-good if you are super hungry. We really liked the healthy options here. Granted, if you are on holiday, diets go out the window-but you can still make room for things like tropical fruit special (it’s got muesli and honey) and healthy breakfast white omelet. There may be a bit of a wait-the place is popular-but rightfully so. Everything is prepared with care, and the environment is clean. You can choose some pizza to eat or go with a traditional Indonesian dish like mee goreng. Take advantage of their small bakery selection for a sweet and tasty treat. Bikini is a relatively new restaurant in Seminyak and comes from the people behind the very successful Sisterfields and Bossman. Bikini has been designed to redesign formal dining and inject a sense of fun and playfulness without compromising on the food. Designed, owned and operates by a clever team of Australian's Bikini is located just a few doors up from their other projects which are all located across the road from Seminyak Square. It can cater for large groups and there is a great bar at the front and the whole fit-out is highly instagrammable with a mural completed with paint filled fire extinguishers. The food is first rate with all fermenting, pickling, backing, curing and dehydrating done on site in the open kitchen. There is a great sense of whimsy throughout and our recent visit on a girls trip could not fault a thing. The cocktails where to die for too! If you're looking to really treat yourself in Seminyak be sure to book yourself a table at Teatro Gastroteque. Teatro means theater, and that’s exactly what diners are in when they visit- a production. 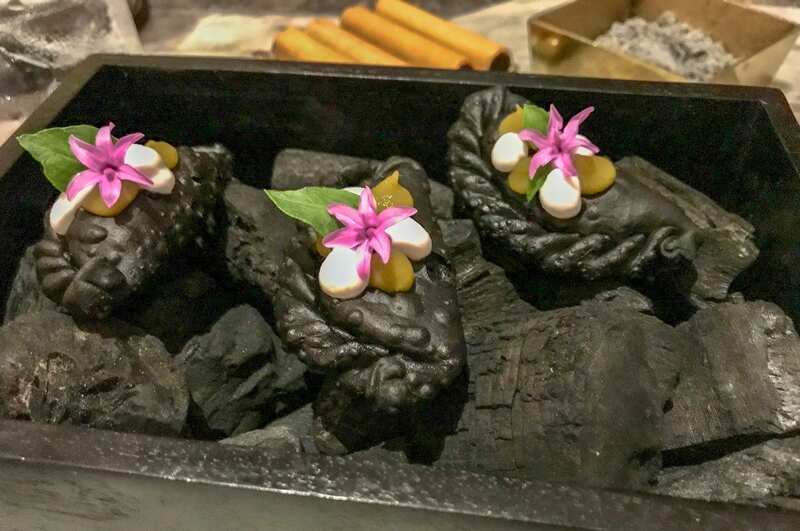 I had their degustation menu and it was one of the best meals I had in Bali. The food was delicious and perfectly plated. The wine pairings were spot on and the service was flawless. Of everything that I tried that night, I favored their seafood dishes. The chef showed a real knowledge of how to work with these local ingredients to highlight the flavors. Reservations are strongly suggested and although you can order a-la-carte I suggest the tasting menu for the best experience. You won't leave disappointed- this restaurant is Michelin star worthy! Great for a food experience. Menu is changed up every six months. Get ready for 9 courses...it is a formal dinner and you get explanations of why each course matters. Truly a unique experience for the most discerning palates. The menu and restaurant are set up perfectly in that they provide an atmosphere that matches the elegance of the meal. Your beverage selection is done for you and the recommended drink is brought out with each course. The name of the restaurant translates to “theatre”-reminiscent of how you can watch the chefs work their magic from the street. Great place for some gluten free options. The service is very good here and you will enjoy the selection. Decor and atmosphere are wonderful too. There is even a DJ on the weekend for those of you who want to cut loose with some drinks and music. You can hang out in the bar and have a drink before you eat, or if you’re waiting for your friends to arrive. You can go for breakfast, lunch or dinner, and no matter what time you go, you won’t be disappointed. The food is presented oh so well. Try the squid ink rice! Find locally sourced ingredients, dishes you won't soon forget, and sweet meals that will keep you eating even after you are full. The taste is that good! If you are a coffee and dessert lover, you must try this place. It has the best burger, which is very juicy and fresh. If you are vegetarian, you can still enjoy your burger without the patty and it will still taste divine. You will also enjoy the pancake and red berries, which features strawberry compote, almond matcha granola, white chocolate cream and raspberry sorbet. If lunch is what you need, try the lamb shoulder and pearl barley salad. You might even try the fresh apple juice, chips, poached chicken salad and nacho fondue dish. Everything is so colorful and fresh. If you're stopping for dinner, try whatever the chef has on special that day. It changes, so it is best to just get a seat on the terrace, chat with a friend and enjoy the night with whatever is on the menu that night. You won't be disappointed, but pleasantly surprised and at ease while you dine. The entrance to Mama San does not prepare you for the stunning interiors inside. From the street it looks like just another restaurant but once you escape the Bali heat you are in for a treat. 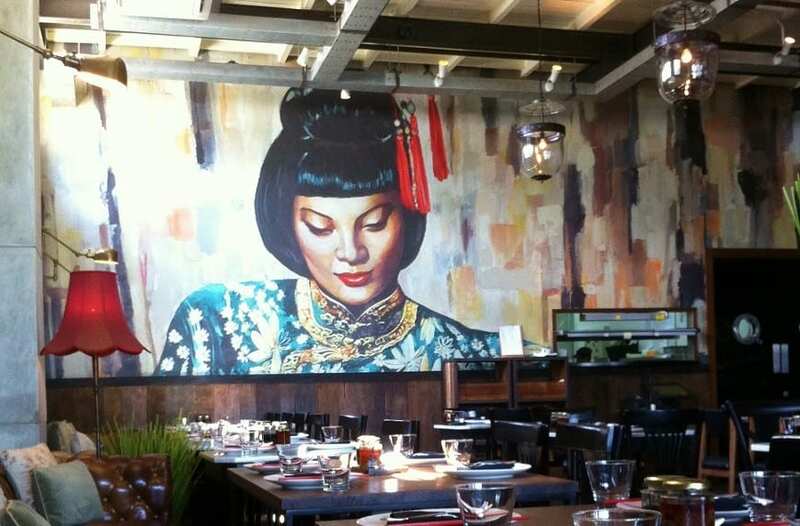 The famous Mama San mural painting greets guests and the old-fashioned decor transports you to another time. South East Asian flavours are a feature of their mouth watering menu that is different for lunch and dinner so there's always a reason to go back. Downstairs is the main dining room and I highly recommend booking a table in advance as it can be booked out each day. Upstairs is the cocktail lounge with a relaxed vibe and is the perfect spot to enjoy Mama San's signature cocktails. After you admire the beautiful artwork and interiors it's time to try and decide what to eat. I visited Mama San for lunch and the Massman Curry was absolutely delicious. The flavours so well balanced and an Australian wine matched it perfectly. To finish off my meal I enjoyed one of the best desserts I have ever eaten, a Creme Brûlée & coconut ice cream affogato. Absolute heaven and I visited once again the next year I visited Bali to experience this dessert again! Mama San can not be missed when you visit Seminyak and if you are partial to air conditioning to enjoy your meal out of the Bali heat, this is the place for you. A cool vibe with delicious food that has been rated highly for years, Mama San is a true foodies delight in Seminyak. ‘For authentic Vietnamese street food, it's hard to go past Bo and Buns in Seminyak. This Asian eatery is heavily based on Vietnamese cuisine with a hip French bistro vibe, the delicious food, snappy service and atmosphere keeps me coming back every time I visit Bali. 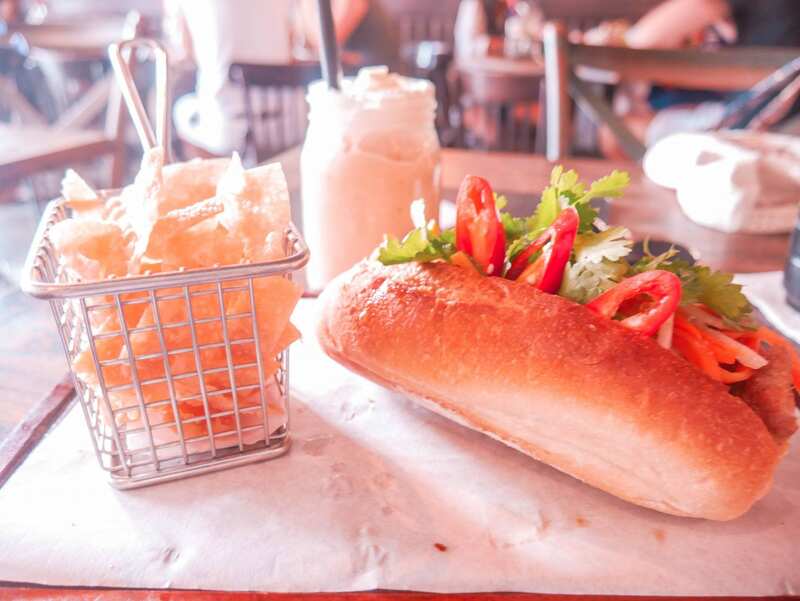 My favourite dishes to order are the crunchy Asian salads, fresh rice paper rolls and of course the famous Vietnamese sandwich sensation, banh mi. The banh mi’s at Bo and Buns are served on a crispy Vietnamese baguette stuffed with melt-in-your-mouth chicken, pickled carrots, cucumber, pate, mayo, whole coriander and topped with sliced chilli & fried wonton skins! Oh and the true Vietnamese experience wouldn't be complete without my favourite frozen Vietnamese Coffee, espresso is topped with condensed milk, crushed ice, milk and finished with whipped cream and cocoa. Yum! Nalu Bowls Shelter Café is a must-visit restaurant in Bali. For us, it represents the best of Bali food – makes use of fresh, locally sourced ingredients, innovative and, best of all, yummy! It is located in Drupadi Street, Seminyak, and opens every day from 7:30AM onwards. Nalu Bowls Shelter Café is a trendy eating place in Seminyak. It is actually composed of 2 restaurants – Nalu Bowls, which offers smoothie bowls, and Shelter Café, which has a more extensive menu of meals and drinks. You can order from both menus on the second-floor dining area.What we love about Nalu Bowls Shelter Café is its ambiance – very chill, great views on the second floor and it’s “hidden” from the main road – and delicious, healthy food. Nalu Bowls is the first-ever smoothie shack in Bali, so it has a good reputation. It has a Hawaii-inspired menu and offers various blends for smoothie bowls. 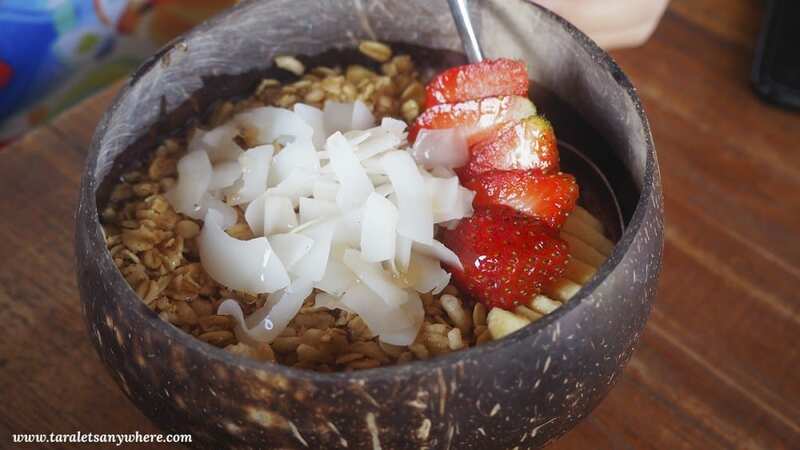 What makes Nalu Bowls different from other smoothie bowl restaurants is that it adds “unusual” ingredients, such as dried coconut flakes, which surprisingly taste well with the oats, fruits and mix-ins. Our favorite here is the Mavericks Bowl, an original recipe made of acai blend with granolas, various fruits (bananas, strawberries, coconut flakes) and honey.Shelter Café, meanwhile, offers breakfast platters, sandwiches, salads as well as various coffees, teas and smoothies. We particularly love Big Breakfast, which is composed of roasted chicken, bacon, sautéed & roasted vegetables as well as toast with jam and butter. Come here for the cold drinks, especially the daquiri, and stay for the Long Island iced teas. Then, put your feet up and watch the people go by under your shady spot while you plan your next adventure in Bali. There is also no sugar added smoothies to enjoy for the healthy eaters, and you can choose your cocktails to be balanced or strong. They also feature vodka coconut and mochi ice creams, so that can be a nice treat at the end of a long day walking around. We liked the Philly Cheese Steak-it was authentic and good bar food. Here is a place that specializes in great coffee and even more competitive pricing. You may have to wait for your table and your food, but your taste experience will be well worth it. We advise you to try the espresso, as it rivals what you might find in Italy. Food is plated so beautifully you almost feel bad eating it. Fried rice and avocado toast make for the nicest brunch you ever had! Or if you require some protein, grab the avocado tomato basil. For dessert, you might indulge in an iced cappuccino and share a piece of the New York style cheesecake with your friends, or just get a piece for yourself to enjoy. Keep in mind it can and will get very noisy in here, so be sure to bring headphones or wait for off hours to come visit if you need a quiet place to eat. Good cheap food and nice cold beer awaits! The staff will treat you right, and you can stay cool with ice cream for dessert. You certainly won't leave hungry. It Is all you can eat, and the servers keep it coming! They serve a good salad that you will not be disappointed in. You can take all the time you need, enjoy the cold drinks, and you might not even eat well into the next day-that’s how good it is! I love Greek food. I have an uncanny knack of being able to effortlessly source Hellenic cuisine no matter where I am on this great big planet of ours. And Bali is no exception. Bali is like my second home. I’ve been to the Island of the Gods over a dozen times and we visit at least once a year. 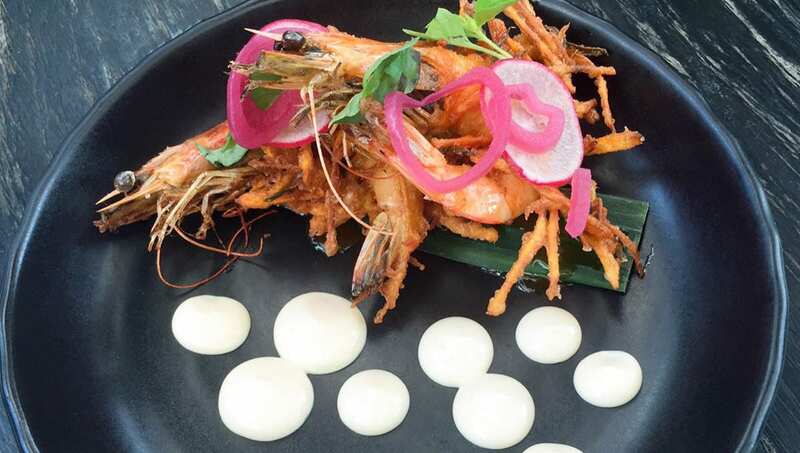 Seminyak is my preferred stomping ground; largely because of the incredible variety of exceptional food on offer. Of course I have my favourite restaurants that I frequent each time we are in town, but every time I book my tickets I find myself especially looking forward to dining at Nostimo Greek Grill again. Nostimo is located on Jl Raya Petitenget which is fast becoming Seminyak’s new ‘eat street’. The décor is typical of a rustic neighbourhood Greek taverna with white washed tables and lots of blue. The fairy lights add a romantic touch after dark, but you don’t come to Nostimo for the ambiance, you come for the food. The menu is tight and includes all your favourite Greek staples. The Hubs and I are creatures of habit and always order the chicken souvlaki platter (IDR750k) and soutzoukaki (IDR850k) platter respectively. Nostimo’s signature lamb kofte balls never disappoint and the tender chicken chunks are delightfully seasoned. Save room for the hand cut chis because they are just divine. Whether you choose the chicken souvlaki or the Soutzoulaki (or pick something of your own) you simply can’t go wrong at Nostimo. Here is a place to go if you care to have an upscale dining experience. One thing to mention right away is that the place does not offer a children’s menu, so you may have to order something creative if traveling with very small eaters. Don’t neglect the drink menu-you will certainly find something to suit you. Between your meal’s courses, you can walk down the paths and enjoy the lively and sensory-stimulating decor, or just kick back on the sofas and relax until it is time to enjoy the next course. If you desire authentic Balinese food, this is the place to be. It will give you all you desire as far as cultural taste is concerned, and you will get the taste of the local, small cafes (known as warungs) at this beautiful restaurant. Reviews all over the Internet indicate the favorability of this restaurant to holidaying families and locals alike. Go for a traditional Balinese dish like chicken sate or prawns, and then top it off with dadar gulung. You will love the different flavors and you will come back for more. Go in with a reservation so that you are guaranteed a table. It is a place owned and operated by the same folks who brought us La Lucciola and the decor is upscale and stunning. Dress well and get ready to eat in style. There is water everywhere and you feel like you are dining on an island…. while on the island! The servers are professional and well dressed. Maison Bistrot in Seminyak offers you up some amazing fried rice, or nasi goreng, as it is called. Portions are the perfect size, and you will enjoy the quality of the food, too. Translating to “fried rice” in Indonesian, you will eat it with pieces of meat and veggies mixed in. The rice may be cooked in a cooker or stir fried with sweet soy sauce and some spices. Then, egg, chicken and prawns may be added to fortify the dish and give it some flavor. The dish has spread in popularity to Sri Lanka, Suriname, and even the Netherlands. The soy sauce caramelizes and gives it a distinct, smoky flavor. It is much spicier and stronger than its Chinese counterpart. You can eat this dish at any time of the day, and many eat it for breakfast. Merah Putih (named after the red and white colours of the Indonesian flag) was established by Australian chef Kieran Morland with local chef Wayan Mustika. It's an extraordinary space, with soaring ceilings and a dramatic feel, but the good looks hide several clever sustainability features, including rainwater harvesting. Morland is on a bit of a mission to take Indonesian food to the rest of the world and this is certainly very inventive and exceptionally well presented cooking. There are some classic dishes but also some different takes - certainly a bit out of the ordinary from other local food along Jalan Petitenget. Apart from staples like nasi goreng and gado gado, my knowledge of Indonesian food is fairly limited, so many of the descriptions on the menu are a bit lost on me but the menu reads well. There are also great cocktails and craft beer - a real bonus if you’re looking to have something other than the ubiquitous Bintang. The dish featured here is called Pekedel Udang - school prawns and sweet corn fritters. 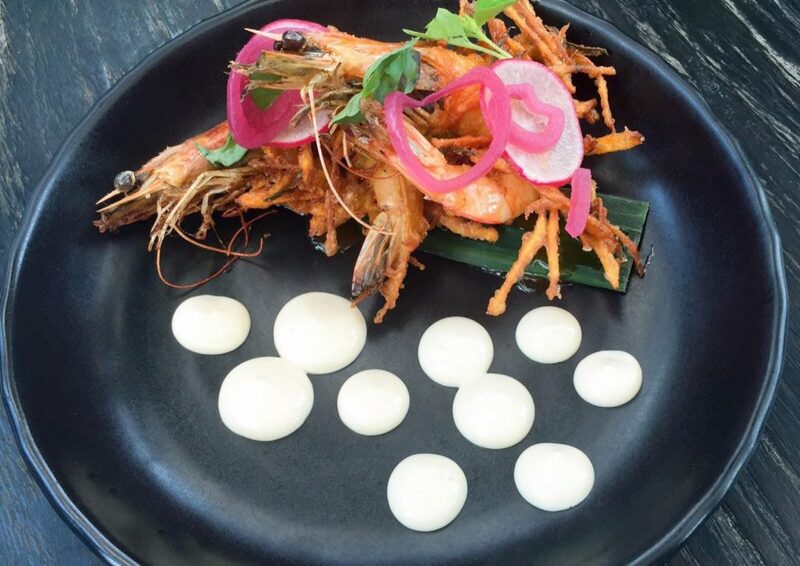 Beautifully cooked prawns combined brilliantly with the fritters, plus some radish and pickled onion rings. 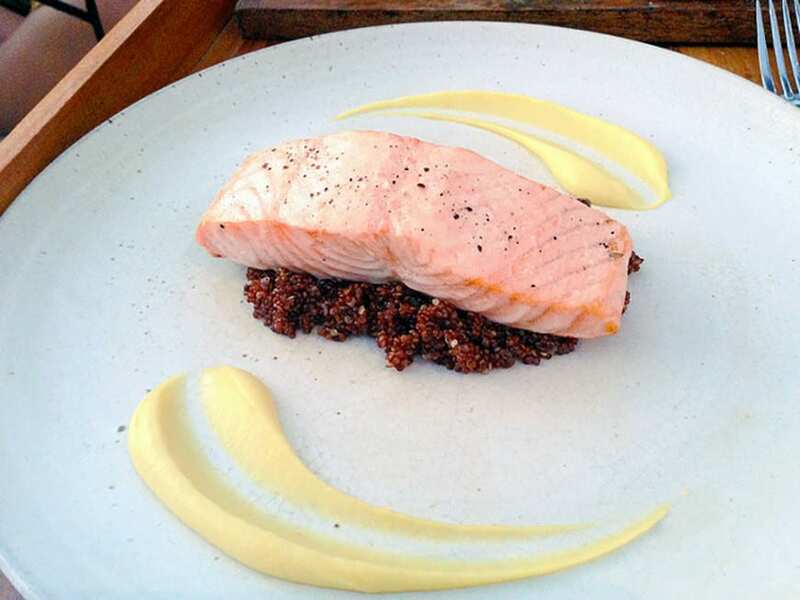 The plating was incredibly pretty with dots of mayonnaise looking like little pebbles. Delicious. Just a note about the dining room - there’s no smoking where you eat but it is permitted in the bar which is on a mezzanine at the front. Be prepared for things to get a little smelly during a busy service! Sambal is one of the best Balinese foods as it is so versatile and used in many dishes across the Balinese cuisine. This is a hot sauce, sometimes a paste, that is made from a variety of chili peppers. You also will find ingredients like fish sauce, rice vinegar, lime juice, shallots, or ginger, among others. The ingredient is found in foods made in Indonesia, Malaysia, Brunei, Singapore, and Sri Lanka. Varieties of sambal exist that taste great in their own ways. For example, sambal dabu dabu is like Mexican salsa. You mix chopped tomatoes, lemon cui, shallots, Birdseye chili, basil, hot vegetable oil, salt and red chili to make it. We think the best and highest quality sambal can be found at the Pencar, as you are able to select your sambal to match your taste. We suggest Nasi Goreng Sari Laut, as you get the delicious fried rice and the wonderful tradition of sambal. This is a traditional Indonesian soup that consists mainly of broth, meat and veggies. It is served hot, and enjoyed nationwide in Indonesia, Malaysia, Singapore and Brunei. It is certainly worth a try, as it is considered the national dish of Indonesia. It is sold in restaurants both fine and casual, and even available in open-air markets too. Chicken Soto is the Indonesian version of chicken soup, which we drink when we are sick. Different regions of Indonesia put their own spin on the dish. For example, the Ambon Soto is made of chicken, broth and several spices like ginger and turmeric. The Banjar Soto, on the other hand, has star anise, clove, and lemongrass as its main spices. We think the best version of this dish is found at Warung Taman Bambu, a cash only location with delicious traditional Indonesian food at very reasonable prices. Everything is prepared and ready to go, so if you are hungry, feel free to stop in, tell the servers what you want and then dive into deliciousness. It is hidden away from the town, which is nice as it is not so busy. Staff is welcoming. We recommend garlic butter prawns. You can get your meal as spicy or non-spicy as you like. Also, Satay is great here. The entire place is family owned and operated, so they take care and pride in their business and make it a point to serve you well. After you have enjoyed your favorite dish, order up some baked bananas or some fresh fruit juice. You will want to come back for the hospitality alone. Prices are fair and well worth it. If you want to try the famous Babi Guling rice, this would be the ideal place for you. You won’t be disappointed with their food quality. You might have to wait for your foods to come but that’s because the restaurant is very popular and busy at the same time. Warung Babi Guling Pak Malen is mostly full of tourists and locals. Their food is cheap and they’re only specialising in one item. It isn’t a big serving, but their food is very flavoursome. The pure orange juice they’ve is very sweet but it just a perfect match for the dish. When we usually travel to Bali, we spend our time exploring night markets, eating ourselves through the glass boxes where traditional Indonesian food is being displayed and trying out heaps of delicious looking street snacks. However, once being in Bali for a longer time, there might be this one day where we just simply crave for some good pizza. Throughout our time in Bali, we found a nice little place in Seminyak, which is serving super authentic pizza. Why? Because the owners are actually from Italy, so what can you expect? Warung Italia is not only named “warung”, which is the Indonesian word for restaurant, but it also partly follows the concept of a warung, meaning that some of the smaller dishes are being displayed in a showcase and can be put together individually on your plate. 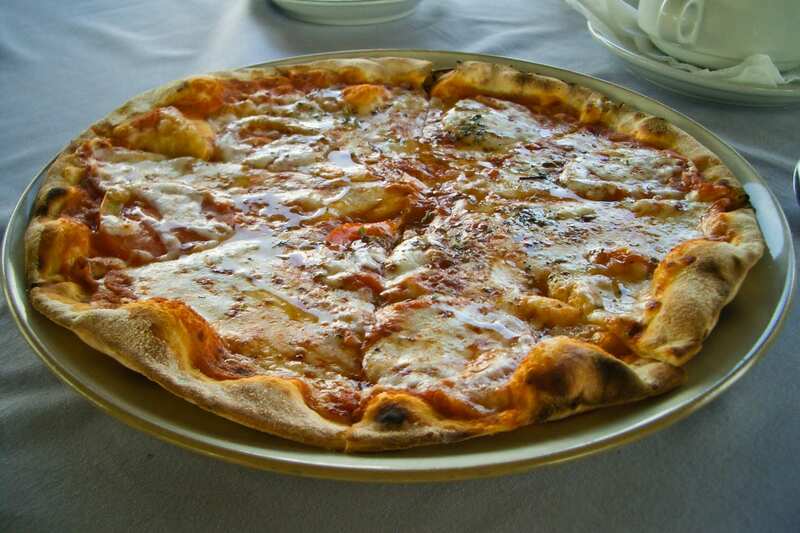 Apart from that, they do offer an extensive list of pizza – from small to big to huge, filling up an entire family. Side note: they have great wine too, a nice terrace and real espresso. We usually got here for dinner, which is usually the time during which seats are filled quickly and the atmosphere is becoming a mix of actual warung, with lots of Indonesians, and tourists longing for their craved Western food. However, Warung Italia manages to neither being such a typical hipster spot, in which smoothie bowls get instafamous, nor a simply warung – it’s just a great place for great food with great people. Great spot for some Italian food where prices are reasonable, and taste is good. Go with the spaghetti carbonara. You will enjoy the flavorful taste and the freshness of the parmesan cheese. The pasta here is cooked to perfection, and your entire family will find something that suits them-others report coming here with spouses and kids and everybody was happy. The children will enjoy the lasagna, as it is a welcome taste of home, while the adults can try something new. Everybody will take delight in their decadent tiramisu at the end of the meal-it is truly a must have. Are you craving Italian food, in a modern, updated space that caters to young and old alike? Then come to settimo cielo. You are going to enjoy pasta dishes that are homemade, classic dishes given a new, fresh spin, and pizzas that are unlike anything you’ve ever tasted. The steaks, seafood, and side dishes will be one for the memory books. There are also wine and cocktails available to make your experience even better. The place is for everyone-couples looking to celebrate special moments or families who want quality and value. For example, Mondays offer buy one get one pizzas with delicious, fresh toppings. We enjoyed the margarita pizza, as the cheese seemed to melt in our mouth. The tomatoes were fresh, and the dough was perfectly kneaded and not too thick or thin. Grab a favorite wine and get ready to savor your own delicious, fresh meal. This is a much-loved spot among visitors to Bali, and they just call it La Looch. You will dine in utter beauty on the Seminyak beach and enjoy a fusion of Italian and Mediterranean fare, with hints of Asia thrown in. We advise the filer of coral trout with pancetta, which comes with a side of marinated artichokes and wild rocket plus some preserved lemon dressing. Close down your meal with a soufflé crafted of lemon and vanilla, and then take a stroll to look at the nearby beach. This is a nice first night choice for your trip to Bali, as it shows you all the good things to come your way in the coming days. There are two levels of dining to enjoy, so there is plenty of space, however we recommend getting a reservation so that you won't be left out of this wonderful epicurean adventure. Seasalt in Alila Resort, Seminyak is a beachfront seafood Indonesia/Japanese fusion restaurant. Our family loves Seasalt because of its beach front view and the understated elegance of its decor. The cocktails here are superb - and having a cocktail while waiting for sunset at Seasalt has become a family tradition. The menu was different on each visit (we’ve eaten there at least 4 times on different visits) but the one thing each visit has in common? We always left the restaurant so impressed! On our last visit, we ordered the agedashi tofu, butterfish, and barramundi. Each dish was brilliantly executed. Rich in flavor with fresh local ingredients so revered in Japanese cuisine. The service was top notch and despite the luxury appearance, we never feel like we need to dress up. One thing they do: before a meal, they bring out a special appetizer on the house. On our last visit, they presented us with salt-encrusted baked mackerel. They bring out the tray with the mackerel still inside the salt shell, and break it apart with a little hammer in front of us. It was just a nice little touch that we all appreciated. Seasalt also hosts local painters or musicians a few times a week which complements the dining atmosphere so very well. Even though Seasalt focuses on food, vegetarian options are also available. The meats are top quality, and the sides are filling. The meal will certainly not be cheap, but you will enjoy yourself and you will enjoy the great taste. The atmosphere is one to be enjoyed with its low-hanging lamps and large windows in the back that provide a spectacular view. You can certainly enjoy looking out of them, but perhaps you will find yourself taking in the superb lighting in all areas of the restaurant, including the bar. The decor is upscale and chic without being too snooty, and you will feel welcomed by the attentive staff. We recommend the slow cooked pork and a glass of Pinot Noir followed by some ice cream made right at the table for you. If you are vegetarian or cannot have meats for other reasons, you can certainly ask for any of their delicious sides or have the servers assist you. While the local fare in Bali is amazing and diverse, sometimes you just need a break and Kiln on Petitenget is the perfect restaurant to have such a break. Situated close to the beach and Temple at Petitenget, it is also a great place to break you day at the beach. Offering modern open air setting cooled by the sea breeze you can enjoy Mediterranean style food served with a Balinese twist. For lunch they offer a meze plater where you can choose five components of breads, dips, kebabs, salads and snacks such as olives to personalise your meal. It makes the perfect lunch as is not too heavy but delicious. On Sundays they also offer a roast which although we did not sample one, it looked and by the reactions of those enjoying it was pretty good..The roast was a generous serving of the meat of your choice ( there is also a vegetarian option) and biggest Yorkshire puddings I have ever seen, filled with freshly cooked roast vegetables and gravy it suited someone with a big appetite. We found their prices competitive with surrounding restaurants in the area but the service and food was so good, we returned twice which is unusual for us when we travel. Open from 11 am to 10 pm, this taco spot is going to brighten your whole day. The service is friendly and quick, and the ingredients are fresh. Everything is made from scratch. The prices are very, affordable and the menu offers even the most discerning eaters something to munch on. All veggies are fresh and washed with mineral water before being used in your dish. If you or someone you’re with are vegetarian, you can enjoy cheesy enchiladas or veggie crispy tacos. No matter what meat you eat, it is available. Tacos come in shrimp, chicken, beef and vegetarian, of course-so all dietary needs can be met. You can find modern favorites like burrito bowls, and the nachos are simply out of this world. Best of all you can enjoy some cold margaritas or mojitos with your delicious food. It’s almost like you walked into Mexico…in Bali! Earth Cafe in Seminyak is one of the most popular restaurants for vegans and vegetarians. It's located at Jalan Kayu Aya in the central parts of Seminyak. You'll be within walking distance from most hotels here. I love this restaurant because of the vibe, earthy interior and the message they're spreading about a healthier and more sustainable planet. The price range is reasonable for quality food in Seminyak with prices from 50 000 IDR to 100 000 IDR per dish. Their dishes are colorful, healthy and reasonably priced. My favorite dishes are the Portobello burger, Veggie burger, Mediterranean Platter and the Seitan Satay. The salads are quite nice as well and you can always count on them being nutritional, organic and fresh. In addition to delicious food, they also make tasty smoothies and other beverages. You can create your own juice, order an energy boosting drink or their health shots. Earth Cafe also has their own Kombucha. The staff is friendly too, and if you have a hard time to decide what to eat, just ask them for their recommendations. But I can assure you that the Portobello burger is always a safe bet if you like burgers. Another dish I haven't mentioned is their kebab, it's fantastic and especially coming from Europe where we have a lot of kebab places, I can say this is full-good quality as a vegan version of the famous meat dish with turkish origins. In addition to being a restaurant, it's also a market where you can buy healthy foods and various organic products. Of course, food delivery can be arranged, either via Grab or the restaurant directly. Earth Cafe also has a second branch in Ubud. Address: Jl. Kayu Aya No.99, Seminyak.